Is his favorite color chrome? 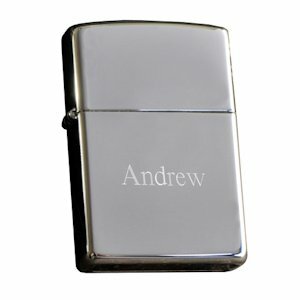 Backed by Zippo's famous lifetime guarantee, this classic lighter can be personalized with 2 lines of text (up to 3 characters each). It has a high polish shine for a traditional look of chrome. Zippos are also windproof lighters. In World War II, a silver Zippo lighter was standard gear for all men in the Army, Navy, Air Force and Marines. A perfect gift for groomsmen. Arrives in a gift box.